You are currently viewing only posts tagged as cad in this guestblog for this year only. Click here to retrieve posts with same tag from other years as well. 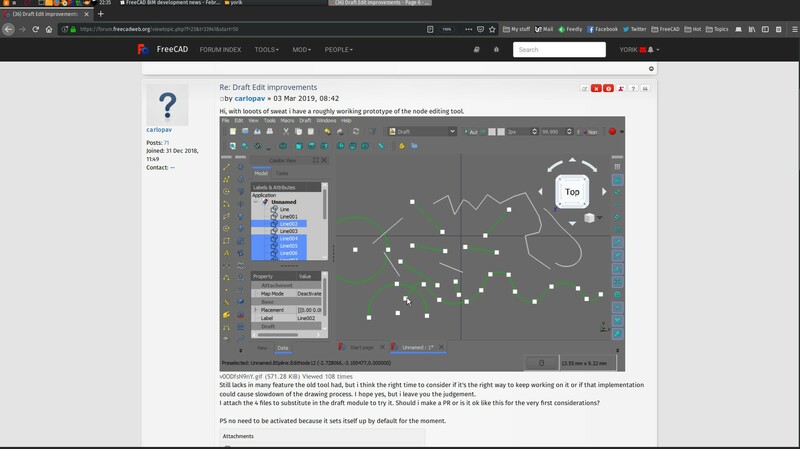 Click here to go back the blog home page, or browse by tag: sketches, saopaulo, freecad, opensource, bede, talks, trilhas, linux, works, architecture, projects, 3d, blender, detail, inthepress, animations, opensurce, firefoxos, idsampa, photo, gaming, wordpress, webdesign, Architecture, orange, cooking, or search the 2018, 2017, 2016, 2015, 2014, 2013, 2012, 2011, 2010, 2009, 2008, . 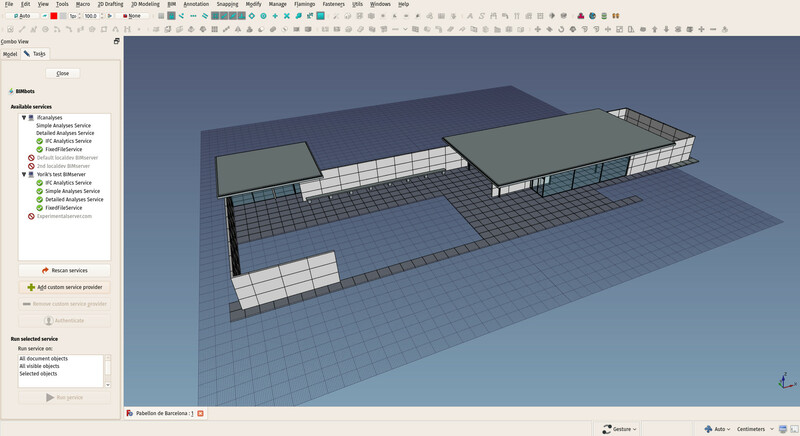 This is the February issue of our monthly report about BIM development in FreeCAD. 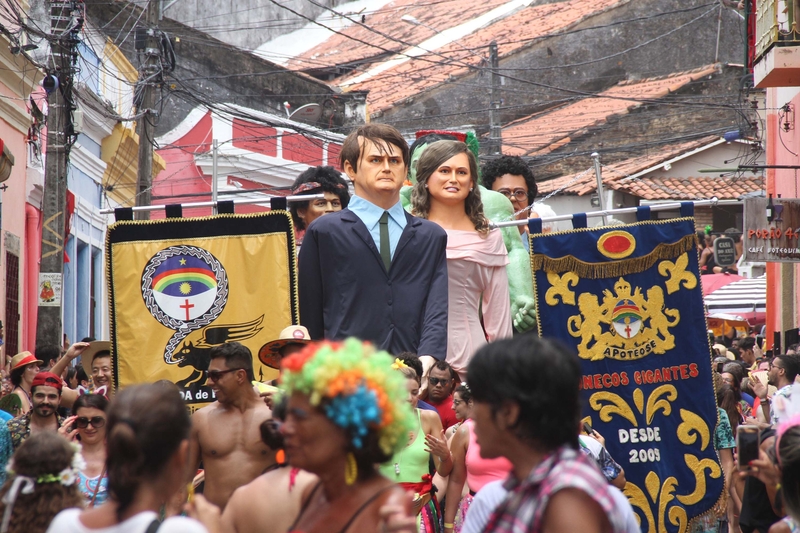 Sorry for the slight delay in producing this article, you know, when you live in Brazil, Carnival is kind of sacred... Jokes apart (half jokes, to be honest), I've been pretty busy on many different plans this month, apart from our BIM development road itself, and there are exciting things coming from several other sides, I'll explain below. Also, we are now on the final stretch of the path to the version 0.18 release of FreeCAD. It took way more time than planned, as usual, but we are almost there. No more blocking bugs, we are just ironing out minor issues in translations, documentation and packaging, and we're ready to go. It will be by far the most stable and usable version of FreeCAD ever. As usual, many thanks to all of you who sponsor me on Patreon, Liberapay or Paypal, I am really glad and honoured you guys still judge this effort worthwhile after almost two years, I think we are more than halfway already. 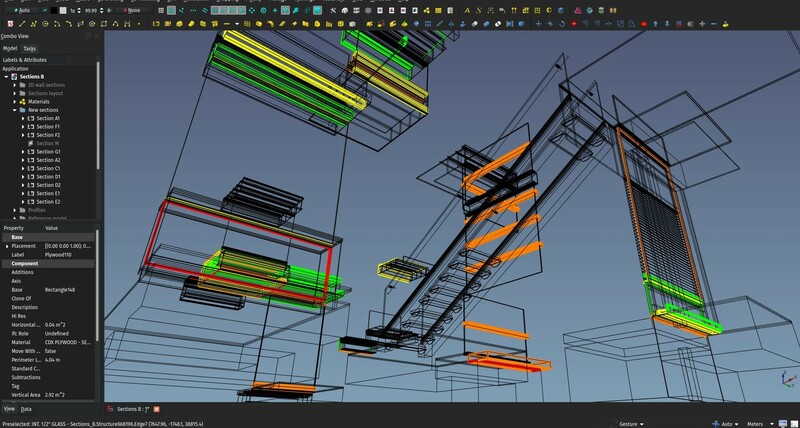 Modelling is already working very well in FreeCAD, I would say at least as well as other BIM apps, even commercial ones, we are already well underway on the second issue which is working with large models, and the third issue, which is outputting quality 2D drawings, will be the big focus of this year. This month we don't have just one video but a larger series. A MUCH larger series. I have recorded them all, but I still need to do sound and editing on several of them (it takes quite a lot of time). So I'll start publishing the first three parts here today, and the next ones will come along in the next days. The total will be 10 or 12 videos (still not sure how to cut). I'll release the final FreeCAD file with the last one too. 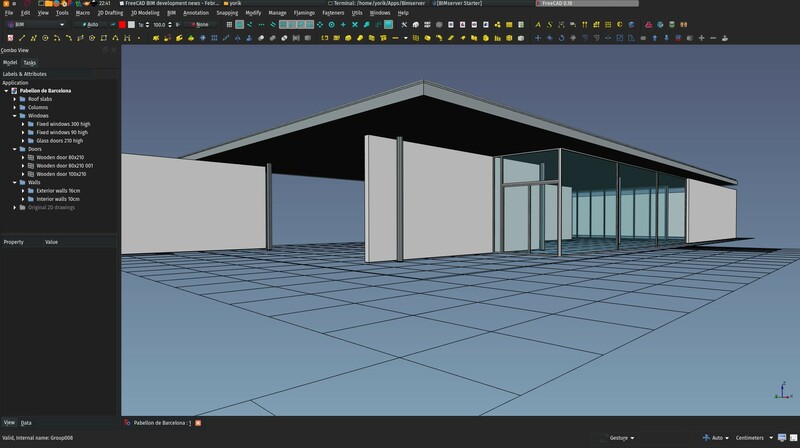 These videos show a small but complete BIM project made entirely in FreeCAD: The reconstruction of the Pabellón de Barcelona, by Mies Van Der Rohe. I tried to go around a bit all aspects of working with FreeCAD, hope you'll like! The DXF file used as a base is here. The FreeCAD importer for Blender has been ported to the forthcoming 2.80 release, which hasn't officially been published yet, but will be soon. Blender 2.80 is really a small revolution in the Blender universe, with many impressive enhancements. 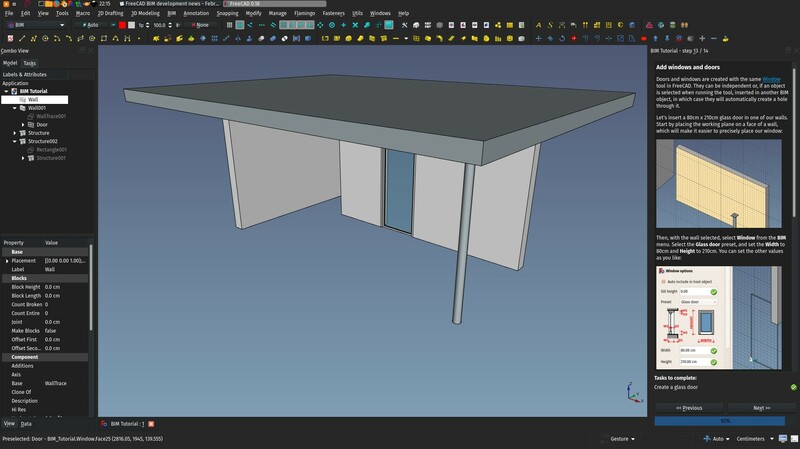 Our FreeCAD importer allows to directly import FreeCAD files in Blender, without the need to go through other exchange formats such as OBJ or 3DS. 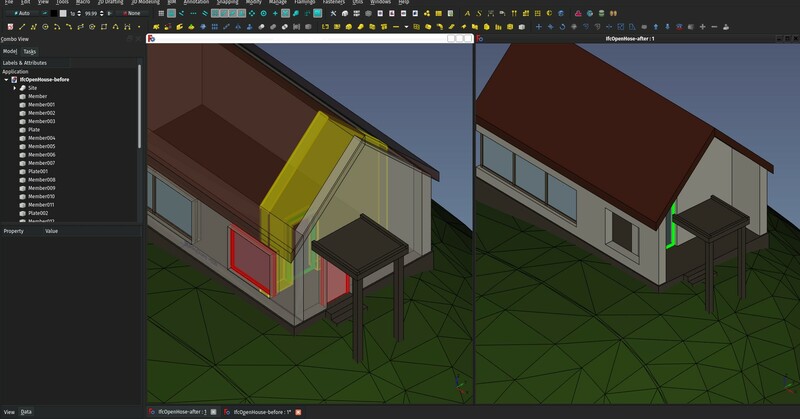 This is specially important for who works with ArchViz and wants to produce gorgeous renderings out of FreeCAD models. As the Python3 version of FreeCAD stabilised a lot and is now being pushed out everywhere and also integrated in Linux distributions. the Python2/Python3 difficulties between FreeCAD and Blender are becoming a thing of the past. So as soon as the 0.18 release is out, I'll register this importer on the Blender add-ons repository, which will make it a lot easier to install and use by everybody. 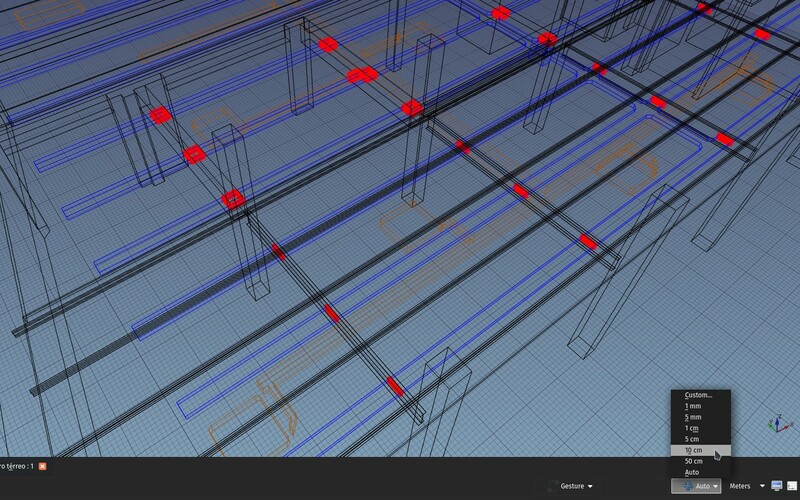 I've worked further on the integrated tutorial of the BIM workbench, and it is coming close to completion. Modelling part is complete, only missing parts are exporting to IFC, producing 2D drawings, and extracting quantities. Be sure to give it a try, and please report (or fix yourself!) anything you think is unclear. This is a very small thing, but of a big meaning I think. Two applications I know of, Sketchup and BricsCAD Shape, place this stylised human figure inside the 3D space when starting a new model. Coincidentally, these two applications are targeted not so much at very technically skilled people, but try a more intuitive and human approach. And as you know, a big part of what we're trying to do here is make FreeCAD more intuitive. 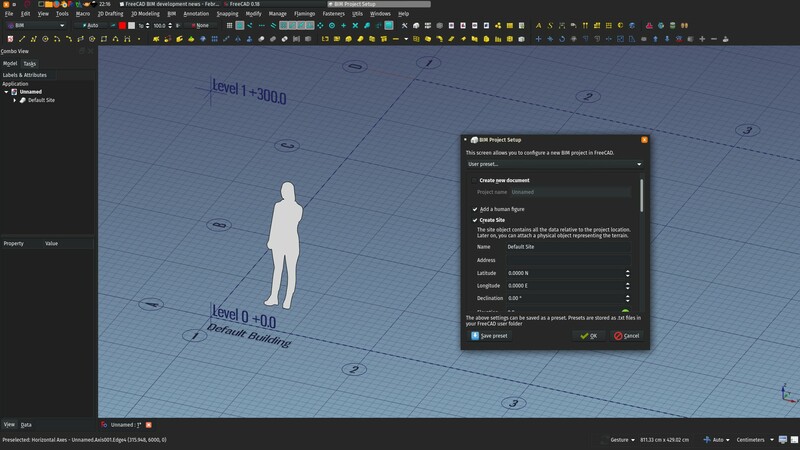 So now when creating a new project with the BIM project tool, you have an option to add this sympathetic figure in you model, which immediately gives a very good sense of scale. Just a note to keep you updated about the forthcoming 0.18 release, which should land in the coming days or weeks now. There will be both Python2 and Python3 versions available, and a pre-0.18 version has been added just in time to Debian, for the coming Debian 10 release. As it is a long-time support version, it will be used as a base for Ubuntu and all its derivatives. So for the fist time in history all these Linux distributions should come natively with a pretty recent version of FreeCAD. We have Kurt to thank for that! We have now processed all the important bugs and most smaller ones, the application itself is basically ready for release. We are just finishing work on documentation, translations, etc... which should take a couple of days more, and you'll be able to put your hands on the 0.18, if you haven't done it yet. We also have a load of new features waiting for the 0.18 release to be merged, so as soon as it's done, FreeCAD development will resume at full speed. 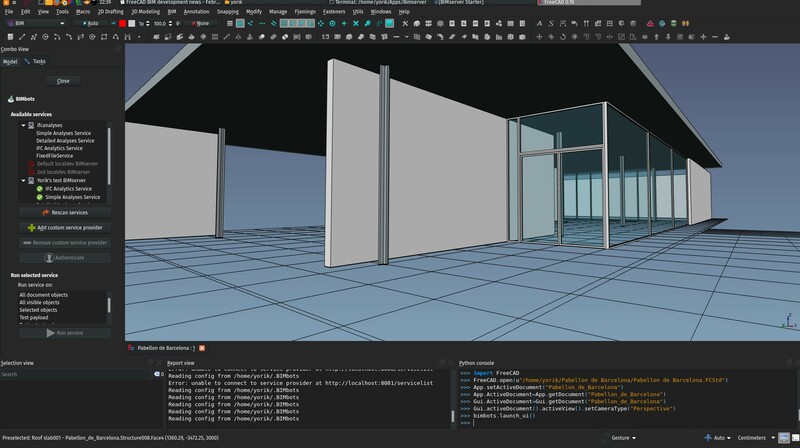 And we have big changes coming in the BIM/Arch area, with deep and meaningful changes to adapt much better to the IFC schema, free ourselves from concepts stupidly copied from other BIM apps. 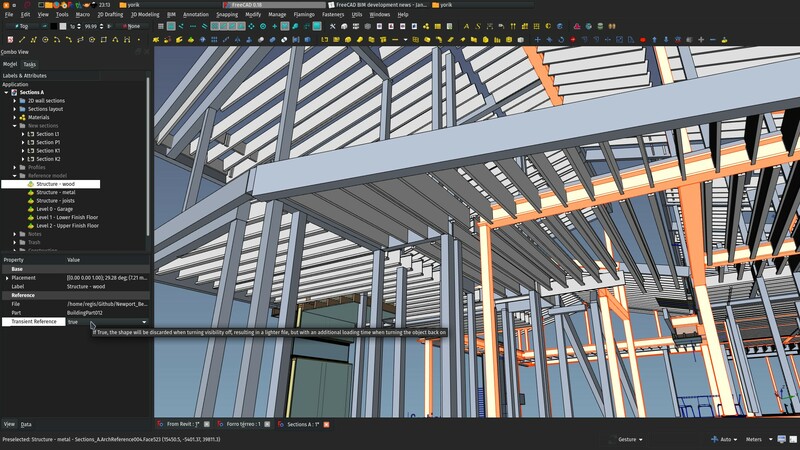 I believe we will find ourselves with a BIM application that is much better adapted to IFC, and at the same time gives much more freedom to BIM modelling. The result of this so far is in this branch, if you fancy having a look, but it's unsatisfying so far and not working at all. The idea was to make TechDraw views not recompute immediately, but in the background, in a separate thread. As TechDraw views are almost always "terminal" objects (only the Page depends on them), and given that they can take a lot of time to calculate, I thought it might be interesting to make them calculate in the background, while you can continue working on other things in FreeCAD. When the computation is ready, the view would get notified and display the new contents. However, it turns out working with threads is very complex and delicate. A separate thread must really be thought as a completely self-contained environment. If it uses functionality implemented outside of itself, this functionality will most of the time run on the main thread. So making things multi-threaded really requires a lot of previous thinking and planning, and in the case of FreeCAD there is also a lot that is not in our hands, such as how the OpenCasCade kernel works. To resume, not much progress on this side. I'll keep toying with it, though, but I don't think impressive things can come from there. SIMVoleon is an extension for Coin3D, our main 3D display engine in FreeCAD, that allows to do volumetric rendering. 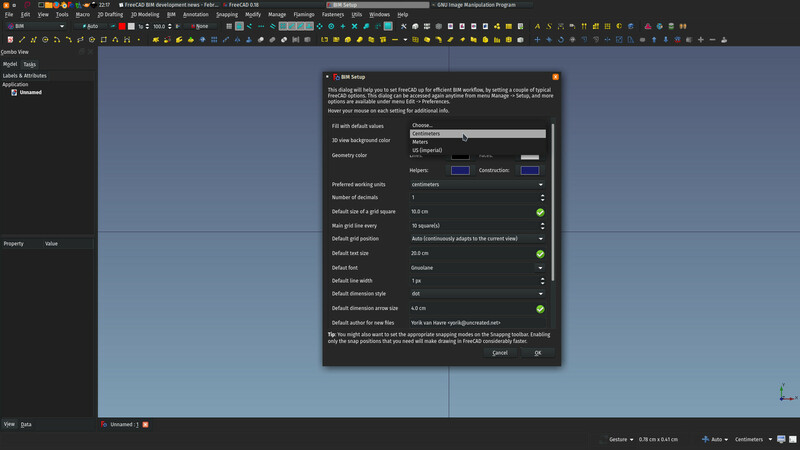 In other words, it can automatically "fill" meshes being cut. Since Coin3D can generate very fast sections through models, but these sections appear "hollow", so the have little use so far, this could be a very useful addition. I had to make a few changes to be able to compile it with recent Coin versions, which are in this repo. The next step will be to try to build pivy with it (it seems to have support for it already), so we can play with that from Python. I've also started playing with generating SVG views directly from the main 3D view of FreeCAD, and this seems so far the most interesting path. It is very fast, produces pretty good results, and if we can make SIMVoleon work with it, might be an excellent solution. There are many changes required to the SVG-producing system in FreeCAD, to control things like scale and line types, I'll start working on that as soon as the release is out. BIMbots is a new idea developed by the people behind BIMServer. 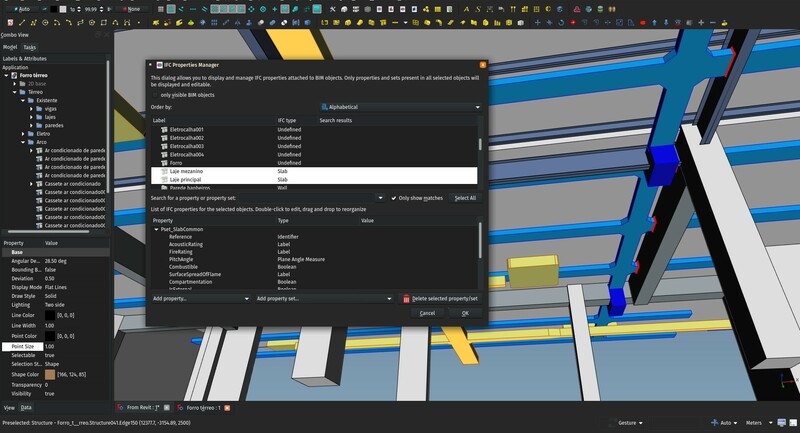 Basically the idea is that you don't need to install and manage a BIMServer yourself, you'd be able to use services provided by a BIMServer somewhere, directly form your BIM application. For example, validate an IFC file, or do all kinds of queries on it, such as counting windows, computing walls area, etc. Together with them, I've started working on a BIMbots plugin for FreeCAD, which is almost ready now, and will be integrated to the BIM workbench as soon as it is ready. I'll also have a look at the developer docs and try to develop (and document) a BIMbots service, to help us assess how we can use it in BIM projects. The way I see it so far, it could be the perfect open-source replacement for rules-based systems like Solibri model checker. 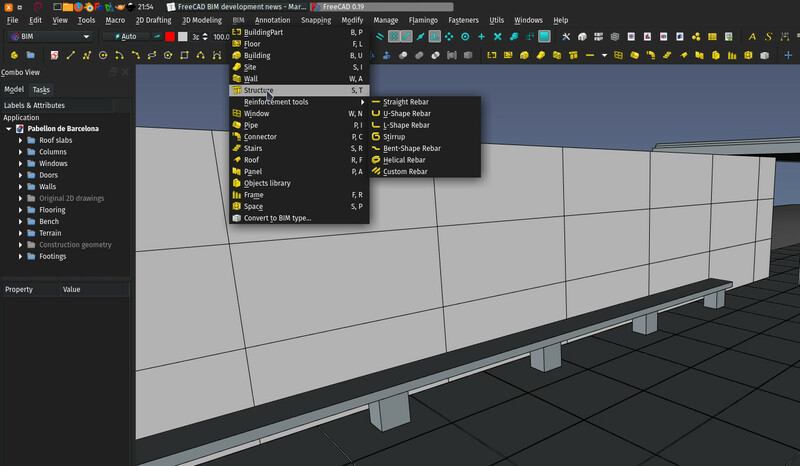 I also started working on a curtain wall tool for the BIM workbench. However, it is a crazily complex problem! 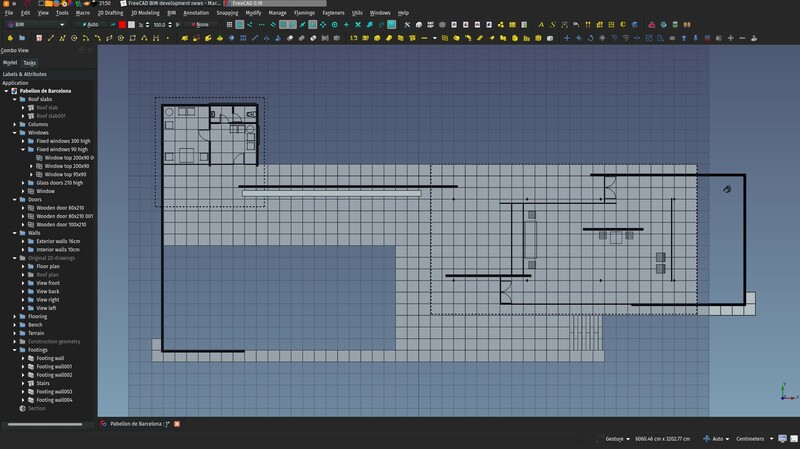 The idea is that you could take any surface (such as one generated with the Surface workbench), decide yourself how you want to "cut" through it (for example using Part MultiSections), then use the produced lines to generate flat panels. The last operation being to generate different kinds of mullions from the edges and glass panels from the faces. Alas, taking non-flat faces and trying to make a continuous series of flat faces from it is not simple I haven't found a satisfying way so far. But ultimately we'll get there. This year again we are part of the Google Summer of Code with our friends at BRL-CAD, LibreCAD, OpenSCAD and Slic3r. This time we're trying to concentrate all our project ideas together, and encourage cross-project ideas. If you want to code for FreeCAD during the norther hemisphere summer (June to August), talk with us! It's open to anybody, and you earn nice Google money! If you follow the forum and the github repo, you'll notice that several new people started contributing actively to the development of the Draft/Arch/BIM areas of FreeCAD. And there is much more to come after the 0.18 release. That's thrilling, I feel we are at a kind of turning point. The future looks bright for 0.19! This is the report of the BIM features I implemented in FreeCAD this month. As FreeCAD is still in feature freeze (as usual, the new release is taking more time than we planned, new bugs appear all the time and we definitely want to squash as many as possible), almost all of the development of this month went into the BIM workbench which is developed outside the FreeCAD core code, and therefore not subject to the feature freeze. There is quite a lot of new stuff this month so I'll make it short. Thanks a bunch to everybody to helps this effort by sponsoring me on Patreon, Liberapay or directly via PayPal! Quite a lot of you are behind this since the early beginnings, almost two years ago, I am really deeply honoured by your trust. This is a very simple tool, that will make it to the Draft workbench too as soon as we are out of feature freeze. It simply allows you to create an arc by given three points through which the arc must pass, instead of the center, start and end points of the default Draft Arc tool. At the moment it produces an object that is not parametric, mostly because I still couldn't make my mind if internally, the resulting object should be the same as the current Draft one (that is, loose its midpoint parameter), or a different one with three vector properties. The IFC Elements manager has now been split into three different tools: Elements manager, quantities manager and properties manager. This is mostly to keep the code elegant and easy to dive in, it was becoming very big and complex, now each distinct functionality is in its own tool and python file, that will make it a lot easier to maintain and to extend. 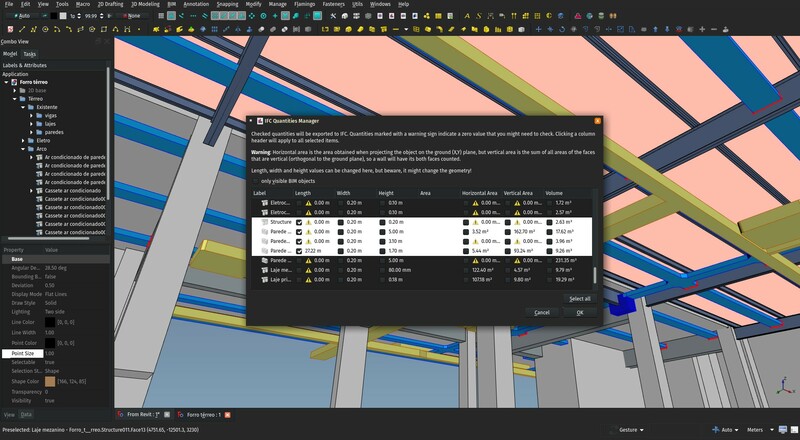 The Elements manager continues just the same as before: It allows you to bulk-manage IFC types and materials of your BIM model, and quickly ensure that everything has the correct type and material. This is where you define which quantities will be explicitly exported to IFC. 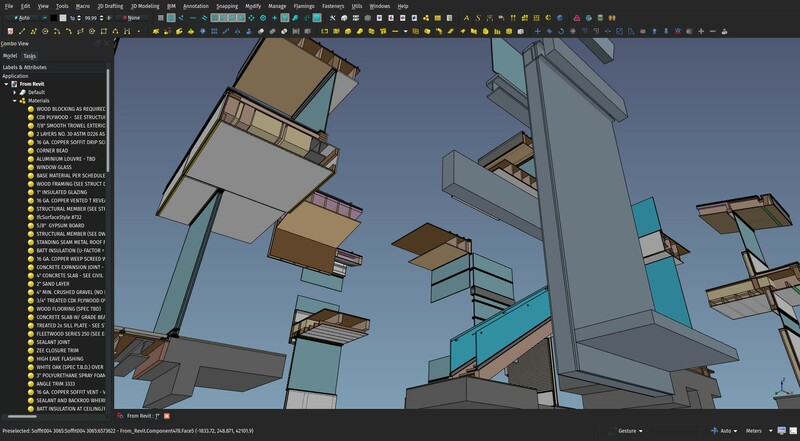 As I wrote in these pages earlier, quantities such as length or width or area of an object can be explicitly written in the IFC file, which makes it unnecessary for other BIM applications to analyse the geometry to know it. A spreadsheet, for example, would be able to quickly calculate quantities from an IFC file without having a geometry engine. With the split of this functionality in its own tool, it also gained a bit more practicality, no more need to click items one by one, you can now select a bunch of objects, and press the column header to apply the setting to all selected objects. The biggest change brought by the split of the Elements manager is that we now have a proper and decent bulk IFC properties editor. It was already possible to add IFC properties and property sets to individual objects, but that's very tedious if you want to apply some standards, such as, for example, add a Pset_WallCommon to all your walls. With this new tool, you can now easily add property sets or individual properties to any object, individually or together, edit the values of those properties, and search objects to check which one has or hasn't a given property or property set. The Classification manager tool has also received a good upgrade. 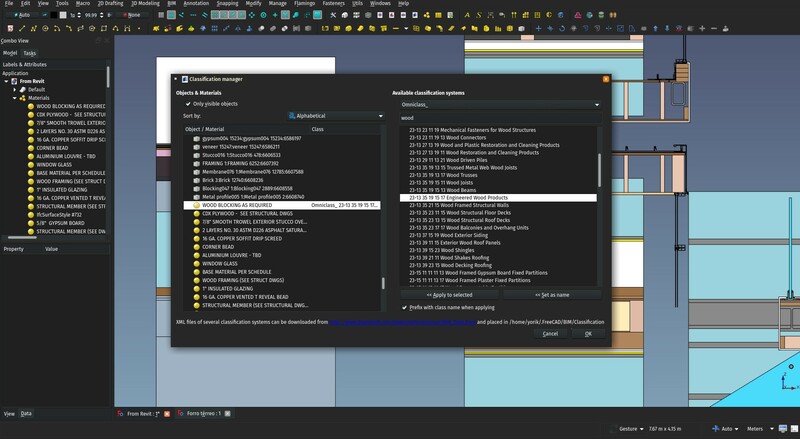 Before, it only allowed you to give classes to materials, now it also allows you to bulk-classify all your BIM objects and gives a clear view of what is missing a class. Note that the classification is still not exported to IFC, but as soon as we are out of feature freeze, that will be done. This is of course inspired by the similar tool in Revit, but I believe we've made something way more powerful here. The idea is that you can use the arrow keys of the keyboard (CTRL+arrows in FreeCAD) to move objects slightly, in any Cartesian direction. This is very useful when modelling details. 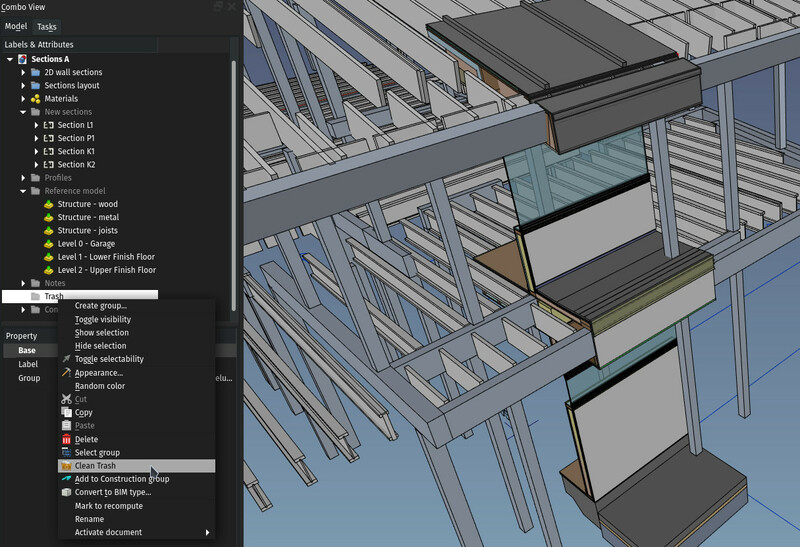 In Revit, how far the objects get moved depends on your zoom level. In FreeCAD, we have two modes: a fixed one and an automatic one. Automatic mode works like Revit, but fixed mode will always move objects by a same distance that you can specify. This can therefore become extremely useful in other situations, for example moving walls, doors or windows 10 cm in any direction. Additionally, the nudge tool is also able to perform other things: Rotate objects by 45° clockwise or counter-clockwise (CTRL+. or ,), and, if the selected objects are walls or structures, expand or shrink their extrusion distance (CTRL+Page Up or Page Down). It also has a control in the status bar, from which you can set the nudge distance. Hovering the mouse over that control shows you all the keyboard shortcuts above. This new tool does the contrary of the Clone tool. It turns a cloned object into an independent copy. So far it only works for Arch/BIM objects that are clones of another, not for regular Draft Clone objects. 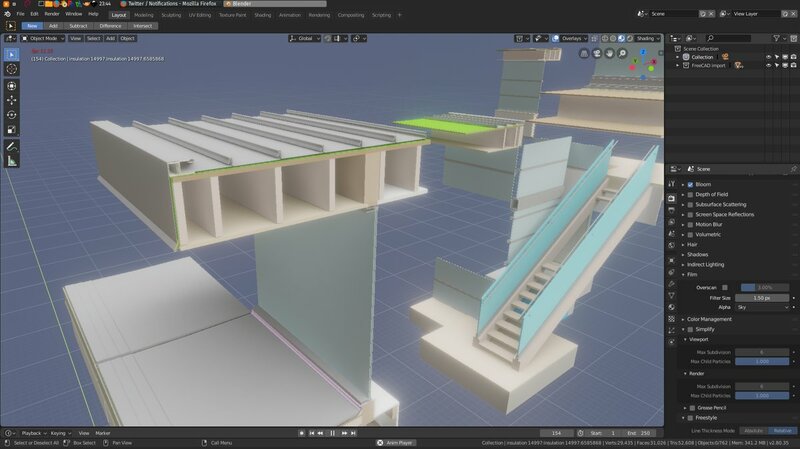 Ultimately, the idea is to reach the same level of comfort as Blender, where it is very easy to play with all this, and you can unlink linked copies or re-link unlinked copies. This tool allows you to select a face of an object, and recreate the object as an extrusion (structure or wall) of the selected face. This is above all useful when you are dealing with a non-parametric object, such as a STEP file or even an IFC file that you imported in "Simple Part Shapes" or "Non-parametric Arch objects" mode, which are many levels of magnitude faster than the "Full Arch objects" mode. So this allows you, for example, to import a large IFC model as non-parametric, and turn only the objects you wish to edit into extrusions. And it gives you finer control too over which face should be the base of extrusion. It also allows you to change the extrusion direction of an object. Or, imagine you made a slab by drawing a rectangle on the ground floor and extruding it vertically. But suddenly you realize you need to give a special profile to that slab. "Damn! ", you think, "I wish I had drawn the profile of this slab instead, and extruded it horizontally". Now it's a piece of cake: Reextrude the slab, then edit its (new) profile. At the moment, there is no test yet to check if the face you selected can indeed produce the correct object when extruded. If you select a face of an object that is not a linear extrusion, it won't give correct results. Before, if you clicked for example the wall tool with a structure selected, instead of creating a wall, the selected structure would be turned into a wall. This was a really annoying behaviour, you always needed to make sure everything was deselected when using an Arch/BIM tool. 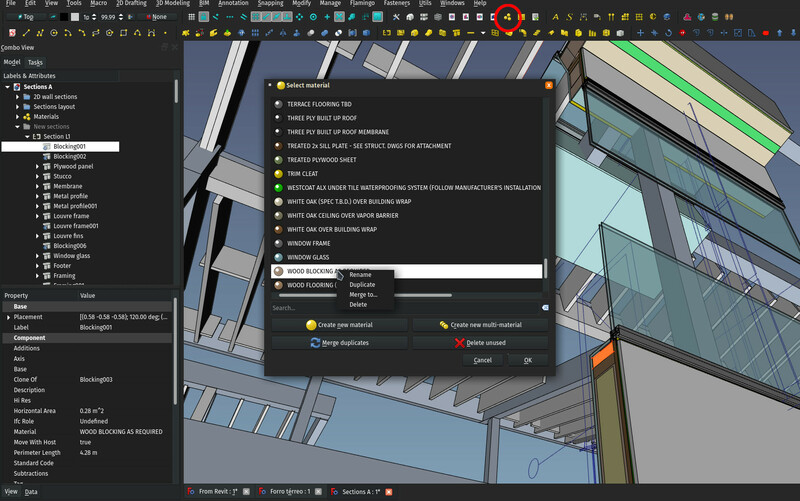 Now that behaviour has been changed so pressing the wall (or any other Arch/BIM button) will always create a new object, regardless of what is selected (if a planar 2D object is selected, though, the behaviour continues the same: The BIM object uses it as a base). So, in order to be able to perform the same operation as before (turn a structure into a wall, for example), this Convert tool has been added. Select an object, click Convert, and choose into which other object it must be turned. 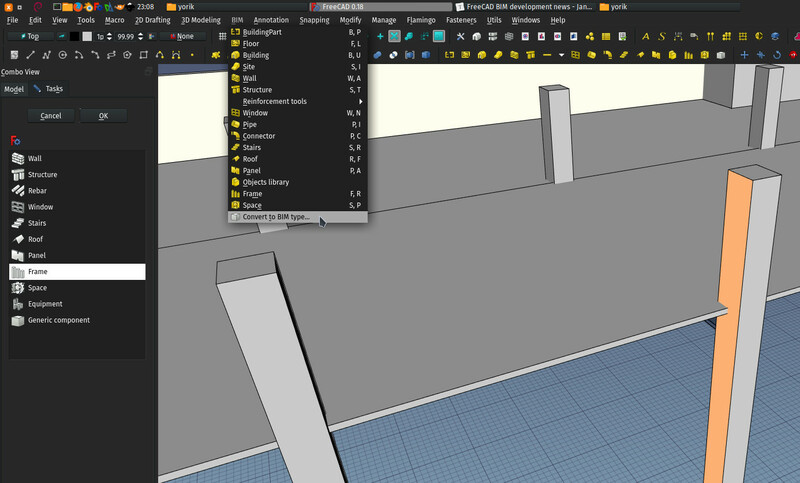 However, since a couple of months now, all Arch/BIM objects are able to take any IFC type/role, such as wall, column, etc.. regardless of the FreeCAD type. So this tool is actually already unnecessary, I just added it to not remove any functionality without providing an alternative one. Also, in an ongoing discussion on the FreeCAD forum (come and participate! ), we are now playing with the idea of semantically separating the geometry creation tool (which basically performs an extrusion) from its BIM purpose (wall, column, beam...). I find the idea highly interesting. 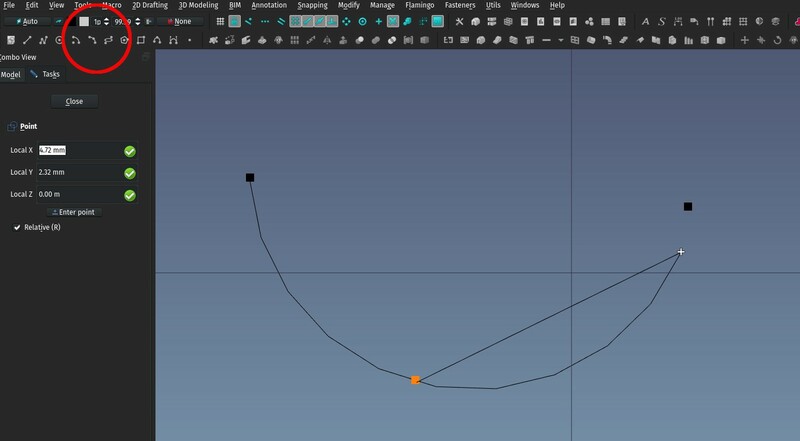 You would basically have a tool to extrude a linear object into a wall-like object with thickness, another that extrudes a profile along a path or direction (structures), a third one that produces "embeddable" objects (windows, doors..), etc. These tools would not be called Wall, Structure, Window anymore, but something like Linear Extrusion. Profile Extrusion. etc. You would give the type you want (Wall, Structure, Window..) to the result of any of those tools. 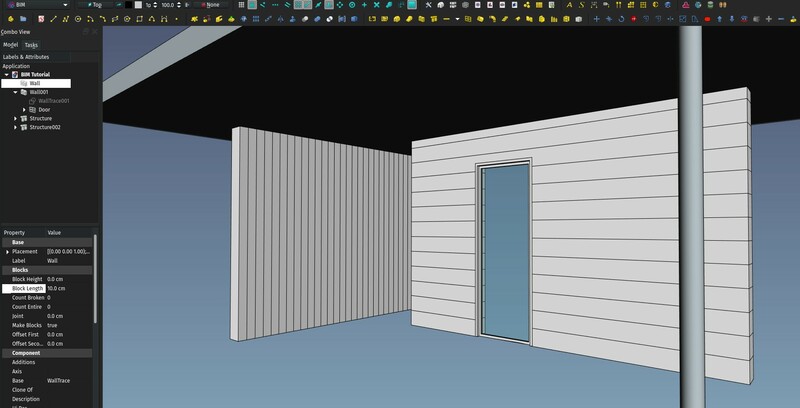 This is much more like IFC works, and is actually something very annoying in other BIM apps, where you cannot make a wall the way you want, it needs to fit in what the wall tool can do. There are still unresolved questions, such as the different properties/attributes (A wall should have a height, width, height, what happens if you suddenly turn it into a roof), but there is a very interesting pull request coming, which starts addressing this aspect, with a completely dynamic model, where the FreeCAD properties of Arch/BIM objects can change on the fly. Of course, we are here speaking of the inner, "core" module (Arch, currently), not necessarily what the user would see. I believe that for user-friendliness, we still need a wall button, a column button, etc... That's exactly where the separation between a "core" module (Arch) and a more "user-friendly" module layered on top of it (BIM) becomes interesting. The Reference tool gained a new ability, which begins to turn it into something really interesting and flexible. Up to now, when you created a reference object, the shape of the object you were referencing would be stored into the host file too. This is the standard way of working of FreeCAD: Shapes are stored into the file, so when you open a file, parametric objects don't need to be recalculated, they just take the shape that was stored. Otherwise loading times would quickly explode. Two more options were added when right-clicking an element in the tree: Ungroup, if you right-click an object that is inside a group or Building Part, which will remove the object from its host, and Select group contents, if you right-click a group or Building Part. 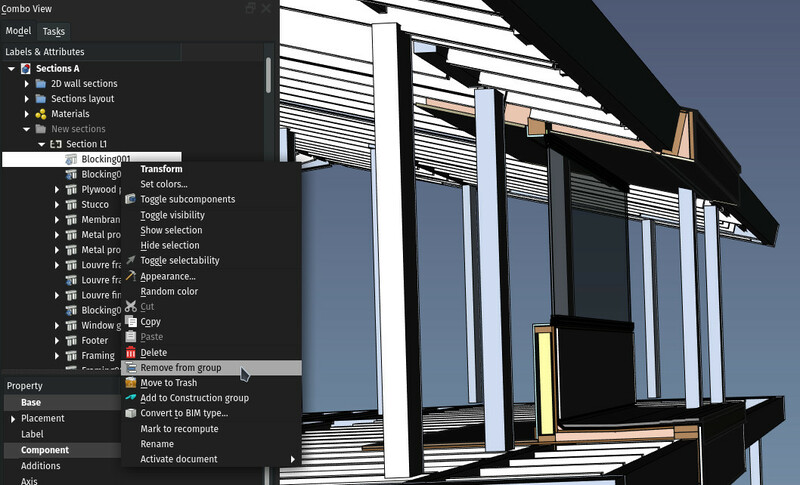 The new materials manager of the BIM workbench also gained some new tools. There are two new buttons to automatically merge duplicated materials (a same material name with 001, 002,... at the end), and to delete all unused materials. By right-clicking any material in the list, you can now also rename it, duplicate it, delete it, merge it with another one. The idea of this tool is also to be very didactic, and give plenty of information about how things should be done properly when working with IFC. There are still visual inconsistencies there (icons that create objects should all be yellow, icons that modify existing objects should all be blue, etc) that we'll address on the way, but I think this is much more logical. Tell us what you think! 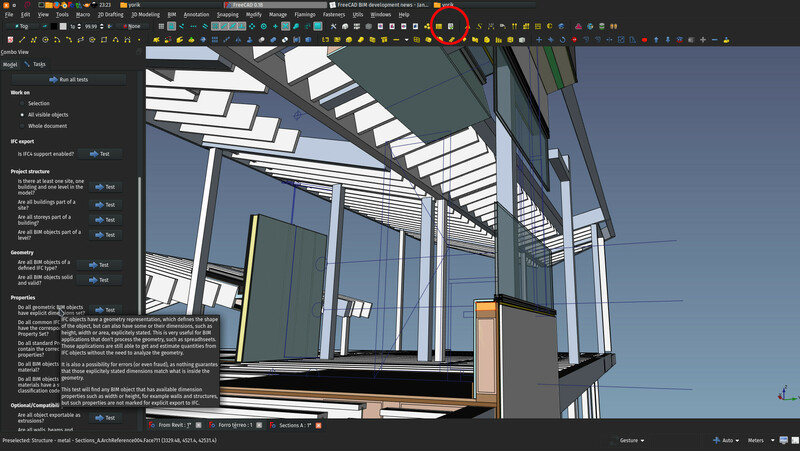 We have another interesting discussion about the behaviour of BIM objects based on another one, such as a 2D baseline or profile. As you know, both the base object and the BIM object have a Placement property. 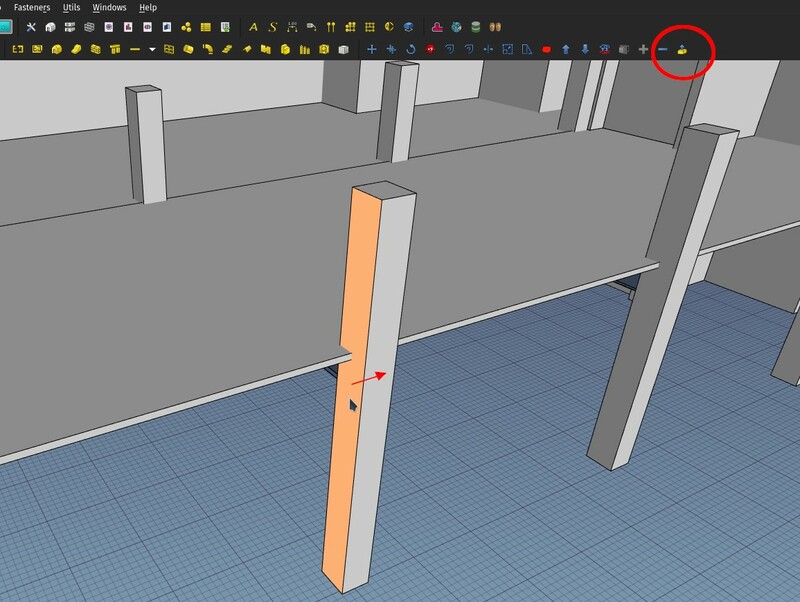 When you move the BIM object, the placement of the BIM object changes, but not the placement of the base object. This is logical, as other objects might use the same base, that would change too if the base was moved. However, the effect of this is that the BIM object is not on top of its base object anymore. If you turn both on, they appear at different places. 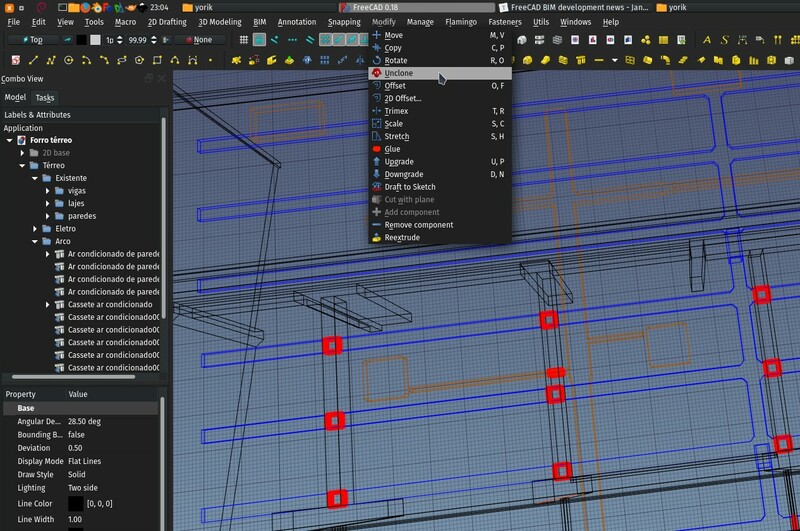 Other workbenches, such as PartDesign, solve this by preventing you from moving the result object directly. 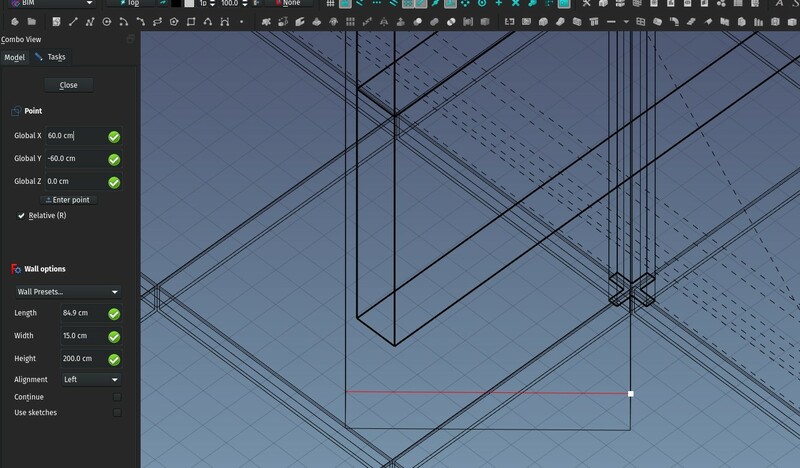 You need to move the base sketch if you want to move the object that is built from it. I don't think that would be good to do that in BIM, though. 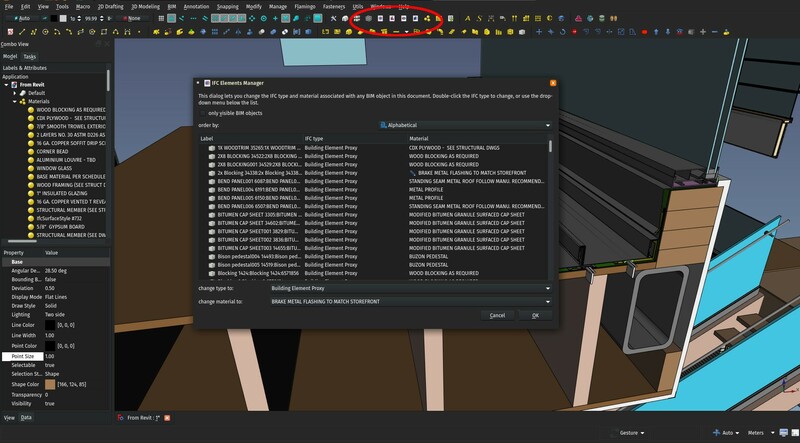 Ultimately, we're probably let the user choose, by adding a property that, if turned on, will in fact move the base object when you move the BIM object. I kept the best for the end. This is currently still developed in a macro, because it still needs some work and fine-tuning, but it already works well, feel free to give it a shot. Diffing is a concept that is used a lot in programming, and is a very, very interesting feature when you work with version control systems (such as Git, which is what we use at FreeCAD). 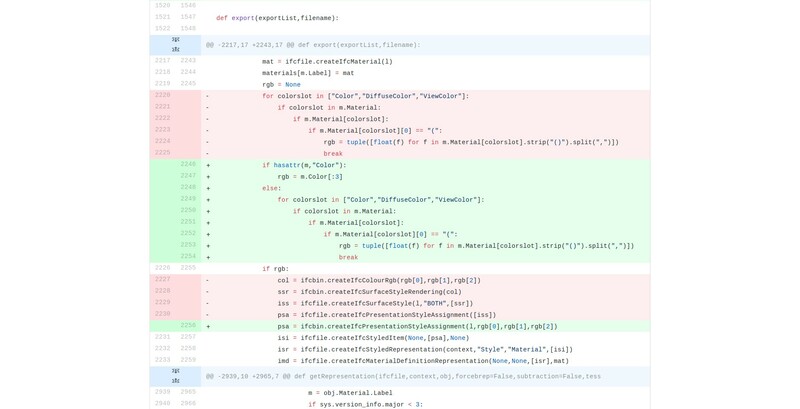 Basically, when you change a file, it shows you in a very clear way what has been changed between two versions of the file: lines that have been added (in green), and lines that have been removed (in red). You can actually compare just about any two files that way, not only two versions of the same file. 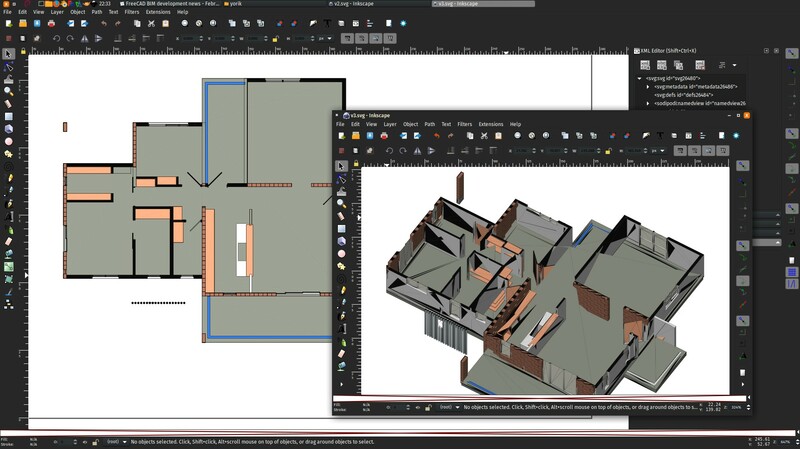 With BIM, as with 2D CAD before, it is always very hard to know what changed in a file. Usually it requires the person who made the changes to mark them somehow (the traditional "revision cloud" that were added on drawings to tell "this has been changed since last version" . However, the IFC format introduces many tools to be able to assess more reliably what has changed and what not. The most fundamental one is a unique ID that is given to all objects in the file. 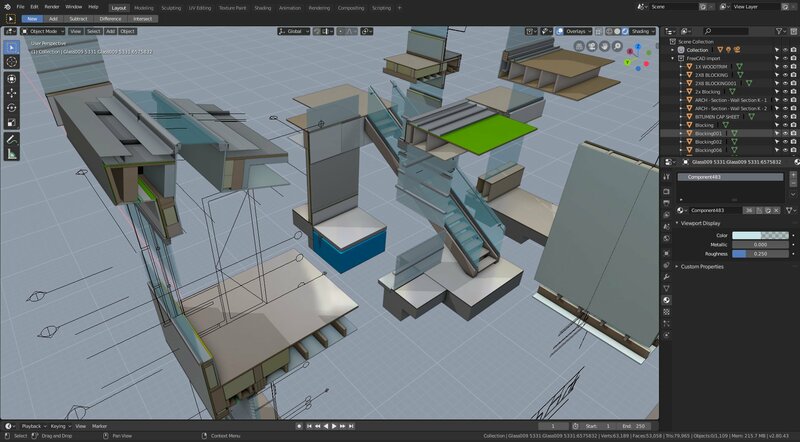 Most BIM applications nowadays, when importing an IFC file, will store the ID of each object, and use it when exporting the file back to IFC. So we have a way to know with certainty, between two IFC files, which objects are the same, regardless of anything else that might have changed (geometry, properties, etc). 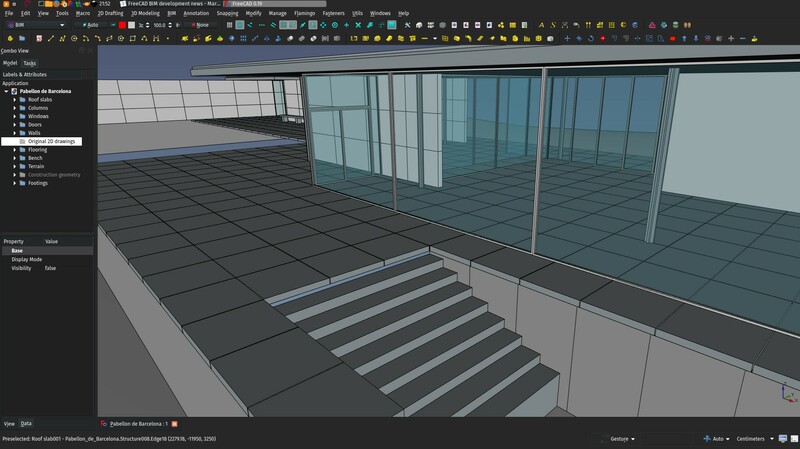 So now our job is simple: Take two BIM models. A same ID exists in both models? It's the same object. It exists in the newer model but not in the older one? It has been added since then. It doesn't exist anymore in the newer model? It has been deleted. That's basically what the macro above does. It takes two FreeCAD models (you can just open two IFC files in it), and paints in red all the deleted objects, and in green all the newly added objects. For all the others, that exist in both files, it does the following checks: Has the volume of the object changed? Has its bounding box dimensions or position changed? Has its center of gravity changed? If any of these is true, we can reasonably assume the geometry of the object has changed, and the object is painted in yellow. If all these tests give no difference, we can reasonably assume the geometry of the object has not changed. It would be very hard to modify the geometry of an object and not have any of the above characteristics change. So at the end of the process, you have a clear view of what has changed between the two files, and, exactly like with code, you can choose the best strategy to adopt: Will you just take the new file and discard the old one? Or will you only copy over the new objects and change the modified ones by hand? Each case is usually a different case. Like with version control systems, the macro is able to do a series of changes automatically to the old file, to reflect the state of the new file, for example update the materials, or rename the objects whose name has changed. Most complex changes, such as geometry changes, will still require you to decide what to do manually. That's it for this month, hope you liked the new developments, and stay tuned for more!